The role of nurse consultant was introduced in the late 1990s to strengthen leadership in nursing, improve patient outcomes and enhance the quality of healthcare services. Nurse consultants have a wide-ranging remit that includes expert practice, professional leadership and consultancy, education, and service development. 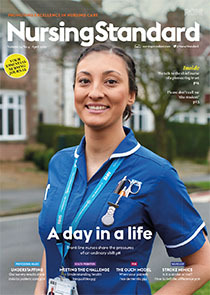 In this article, the author reflects on her experience of being one of the first nurse consultants, which included setting up nurse-led clinics, maintaining professional relationships with medical colleagues and assuming increasing responsibility for services. The article also examines the changes that the nurse consultant role has undergone since its inception in the 1990s.